This review is written upon special request by Hughes who is one of the rare people who cared to leave a comment in my website´s guestbook. 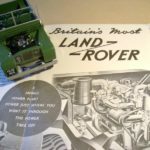 So here it is, the review about the Land Rover Series I by Minichamps. The model is far from new and available in different colours, the latest one in red paint and the same dark green “canvas” top not being the most fortunate in IMO. The Land Rover reviewed here is THE first Land Rover ever with its famous HUE registration and a green colour, which is quite appropriate given the fact that the Land Rover was made from aircraft aluminium left over from British warplane manufacturing after WWII and thus probably painted with the same paint like a Spitfire. The Willy´s Jeep copy was a last ditch effort to save Rover Cars from going bankrupt and the aluminium was only made available to them on condition that they made cars for export to help British economy back onto its feet after the war. Steel was in short supply and luxury cars like the ones Rover had made before the war (“old money” aristocracy would have preferred a Rover over a doubtful nouveau rich image Jaguar) were low in demand, mass mobility not yet a prospect. Marketed “for the farmer, the countryman and general industrial use” the basic multi-purpose workhorse to help re-built (not only) Britain met the demand of the day, thus was an immediate success, consequently became the backbone of Rover Cars for the rest of its history and has finally outlived the parent brand today. Minichamps diecast (!) 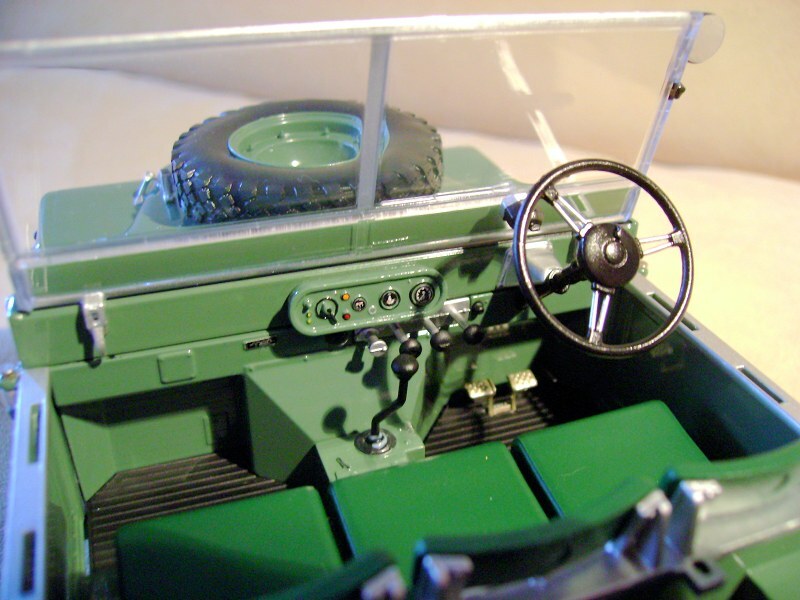 model reflects the basic workhorse nature of the Land Rover well: The doors are hinged to allow being opened 180 degrees. The hard plastic “canvas” top can be taken off, the windowed side door panels can be stuck onto the doors like with the real car, the wind screen can be folded down onto the bonnet, the spare wheel can either be loosely put onto the bonnet or tucked into a mould behind the front seats in an upright position. The bonnet does not have any hinges to allow complete removal. The clamps to lock the bonnet into place are silver rubber. 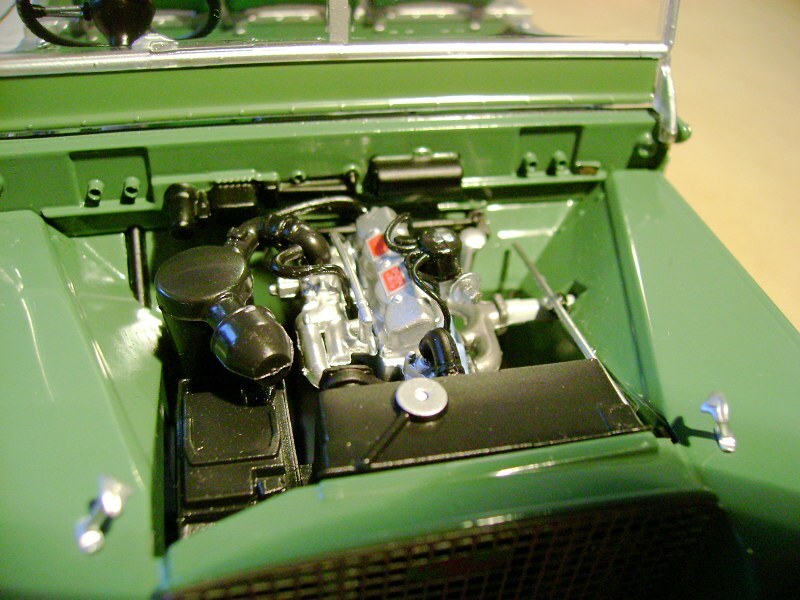 The engine underneath is quite simple – both the original and the replica: we can identify most elements of the workhorse´s simple heart, but mould lines are clearly visible and finer electric wiring is absent. At the rear you can clearly identify the large round hole that gives access to the power take-off that made it a “mobile power plant. 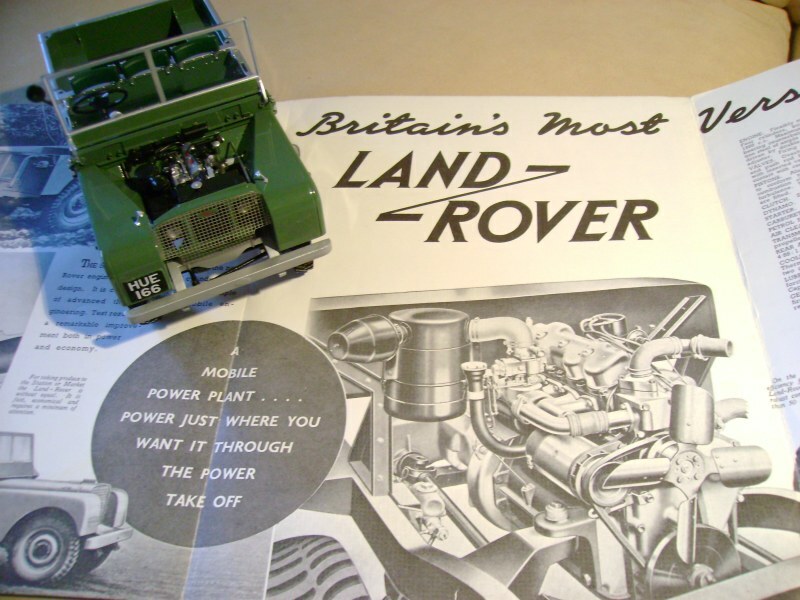 The Land Rover not only was a versatile go-anywhere-vehicle later utilised by world explorers, it gave its owner “power just where you want it” to use machinery where it was needed. Unfortunately, the rear lights are only painted on and the tail gate does not fold down. The interior is very basic too, hardly any creature comforts. The greatest detail can be found on the, err, dashboard. Its layout seems to be correct when I compare it to page 11 of the 1950 manual of the real car (www.landroverweb.com/Pdf-files/manual-series-1-land-rover.pdf) with not much to be found. There is even a light dip switch on the steering wheel. The main gear leaver is correct too, but the horizontal organ-stop-type levers seem incorrect while the red- and yellow-capped vertical levers to adjust the transmission seem to be missing. 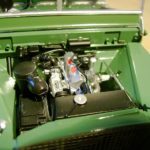 Perhaps a Land Rover Series One expert can help down in the comments. A word of warning for collectors: Of course every manufacturer warns you against exposure to direct sunlight, but some models take direct sunlight without major consequences and some manufacturer´s windows will turn milky. 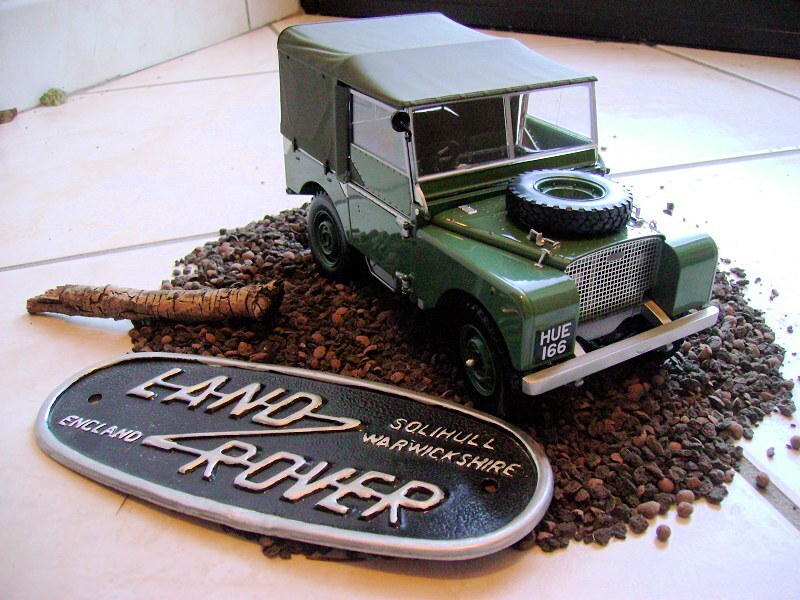 Unfortunately, the Minichamps Land Rover shows signs of that. All in all, the model is a great addition to any off-road division and a real classic. I hope this review is helpful. I do apologize to Hughes for having kept him waiting for so long until I found enough time to do the necessary research during my holidays. I will turn to some of the figurines you admired in my next review. Perhaps I will do a review on figurines only, if more people are interested. 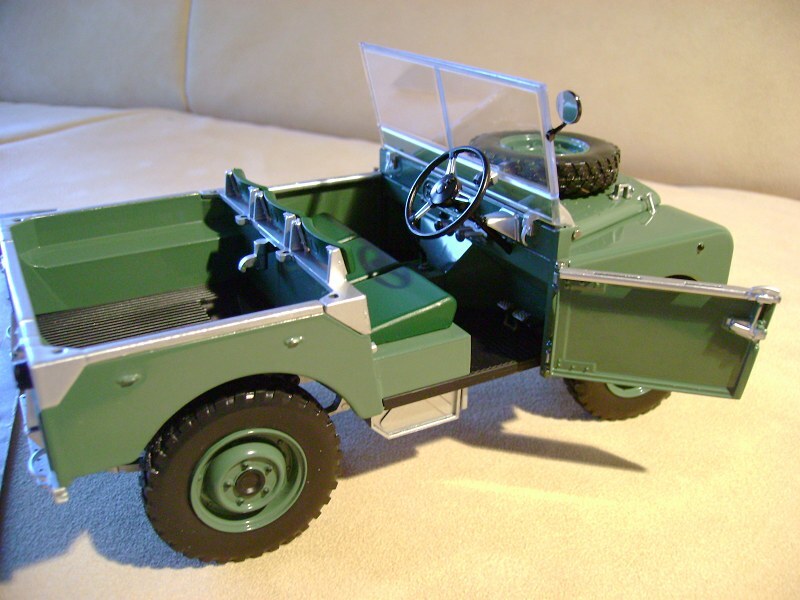 7 Responses to "REVIEW: Minichamps Land Rover Series 1"
Nice review of a nice, authentic piece. Basic, but that’s the beauty of it! You’ve convinced me to pick one up! Thank you so much Karsten, for your review. And I’m Hughes by the way. Finally, the review I expected for so long. But better late than never, eh? So don’t worry. I’d rather wait a while and have a detailed review like this, rather than a poorly-written review. Actually, I’m saving up for this baby now (I’m not sure which version to get yet, but I will make a decision soon) because I just bought the Schuco Volkswagen Beetle Kaefer 1600 Ultimá Edición. So, once again, your review can help me with that. Anyway, are your 1:18 figures from Scale Figures? If possible, can you review them too? And (I forgot too require this one on your guestbook) can you do a review on the Minichamp’s Bentley State Limousine too? Big thanks in advance, Karsten. I am so glad, you haven´t given up on me and you like the review. 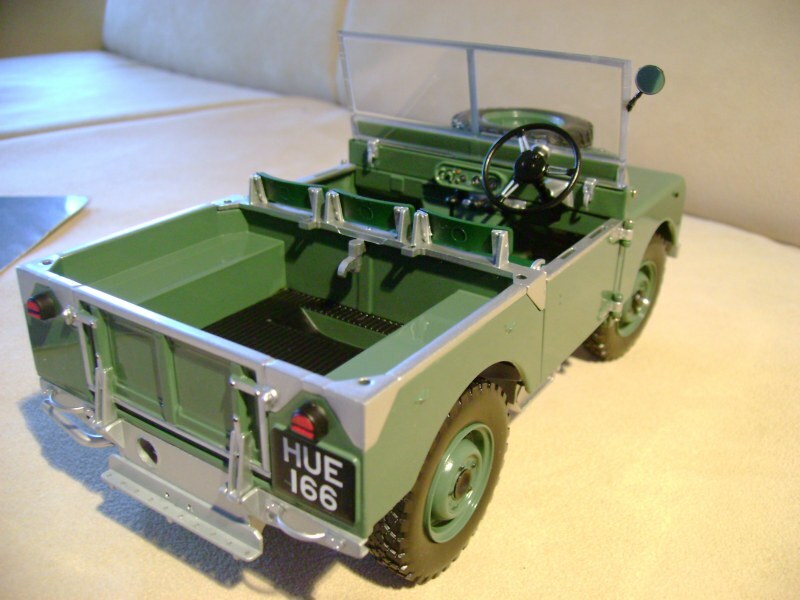 If I had to choose a version, it is this first ever Land Rover (HUE 166) or at least a green one.The most prominent of my figures (e.g. Horacio Pagani, Christian von Koenigsegg, W.O. Bentley, Charles Rolls and Henry Royce) are from Scale Figures, yes, but quite some (the bikini girls on the boats and all policemen) are from American Diorama. I have got one by Fgurenmanufaktur and one by LesMans Miniatures, too. You can even have a 1/18 figure of yourself through some local 3-D-photography/printing shops. Really great! I promise, I´ll do the next review very soon (maybe in the small hours of tonight). I was going to do the NEO Rolls Royce Silver Ghost with Scale Figure´s Charles Rolls and Henry Royce next. But of course, I can start with HM Bentley State Limousine. It´s a pity, no one makes a 1/18 figure of the Queen and Prince Philipp. William and Kate surely would be popular, too, and a nice addition to the Bentley and/or Rolls Royce Phantom VI State Limo´s. Well, my patience is quite “good”, I can say. Furthermore, I’m (mainly) an SUV guy, so this one’s a very special one for me. (About the real ones) As you can see, SUVs/pick-up trucks from the 1950s – 1980s are truly workhorses. Not much creature comforts, leaf-sprung solid axles front and rear (4WD is still generally optional on pick-up trucks, and coil-sprung solid axles are only available later on more “luxurious” SUVs), and does not have any unnecessary features. Unlike SUVs/pick-ups nowadays that are too much like a sedan/limousine. Double wishbone suspension front (independent suspension is easier to drive on-road than dependent ones, and many car-based crossovers even use MacPherson strut front and rear) and solid axle rear, many comforts (leather seats, “Infotainment” systems, associated speakers, and many other electronic devices) that only add unnecessary complexity to the vehicle and making them more prone to breakdown,… The only “workhorse” feature I can see on modern SUVs/pick-up trucks are large cargo space, trailer towing ability, and leaf-sprung solid rear axle + power-take-off (if yours use a diesel engine) for pick-up trucks to bear heavier loads and running other machinery. Today, many people buy SUVs/pick-up trucks for “lifestyle reason”, and many don’t even have a large family, don’t even carry any serious weight, or even bother to take the vehicle off-road at all. Nonsense. Partly, that’s why I love this Series I. Not only it reminds me of the time when SUVs/pick-up trucks are used for the right purpose, but it’s also the “great great grandfather” of a tried-and-true breed of a workhorse off-road vehicle, the Land Rover Defender. Yes, it’s really a pity that no one makes a scale figure of the Queen or anyone in the Royal Family. About the scale-figure-of-yourself thing, I don’t think this is possible in my country, but I don’t like that idea anyway. And the Silver Ghost and Henry Royce + Charles Rolls is a great combination too. I’m also looking forward to that. Once again, thanks for your time and keep collecting! Glad mine isn’t in a light space, windows that turn milky….. I haven’t heard that earlier, that this problem is returning to the scene. If the ‘windows’ turn opaque, consider replacing them them with clear plastic sheet. They would appear to be completely flat on the model. Most of the time I do this (usually to plastic kits) I find that the containers that fruit is supplied in are really clear, if you avoid creasing it. Also – fruit is good for you….. I am overcome with the desire to have one of these.